The first time I used the oven, I made pizza. Very lousy pizza. I admit, I was (am?) lazy and I bought pre-made dough. The pizza wasn’t even worth the charcoal used to cook it. I promised myself that I would never use store-bought dough again, especially if I’m using the brick oven. It was the culinary equivalent of buying a DSLR, setting up a home studio, and taking pictures of, well, lousy pizzas. I was never really good with metaphors. 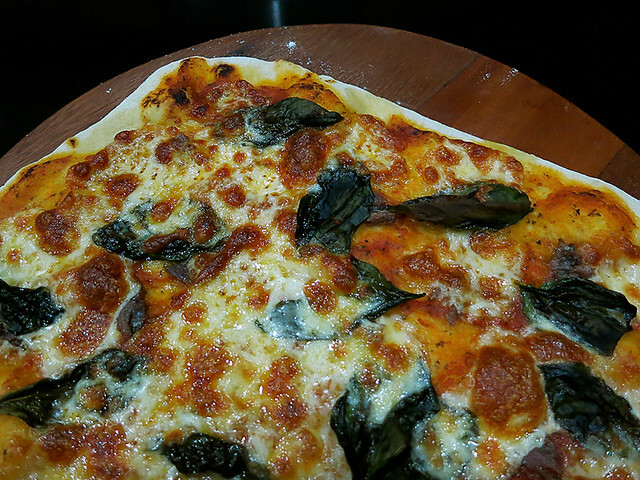 My cousin Marc suggested that I try Marcella Hazan’s pizza dough, a recipe that he’s had much success with in the past. A quick Google search (even though I know my mom has her cookbook…I told you I’m lazy!) led me to multiple blogs that have tried and swear by Hazan’s basic recipe. I say basic because it only has 5 ingredients, most of which we already have in our kitchens. Flour, olive oil, water, yeast, and salt. That’s it. Basic. You can check the end of the post for the full recipe. 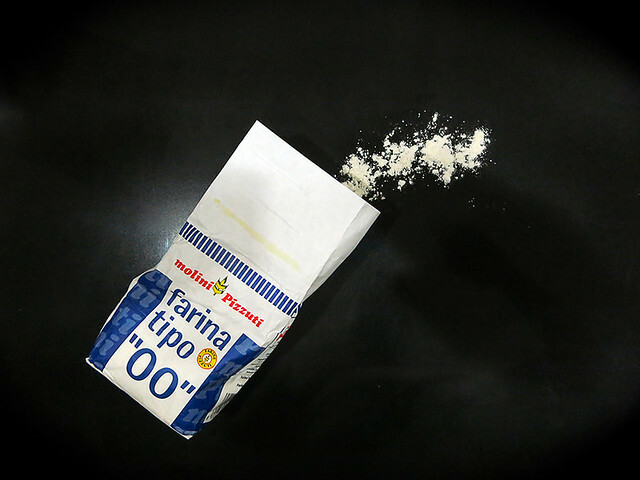 For the flour, I used ’00’ (double zero). I usually have this in my freezer since I also use this flour to make fresh pasta. Making the pizza dough was pretty simple. Combine, mix, stir, knead, rest, punch down, knead again, portion, rest again, let rise, yada, yada, yada. Yes, there’s a lot of resting, rising, and waiting. I said simple, not quick. Once the dough is properly rested, all that’s left to do is roll out, stretch, top, and bake. I kept the toppings simple and used my go-to tomato sauce (canned tomatoes, bunch of fresh basil, garlic, olive oil, salt and pepper), onions, fresh basil, mozzarella, and of course, anchovies. If you don’t like anchovies on your pizza then we cannot be friends. I need to work on my dough rolling and stretching skills. Marcella Hazan’s crust game is on point! Crispy, crunchy, and slightly chewy. Consider me a Hazan fan. I’m sure that the high heat in the brick oven had a lot to do with it but I imagine that her recipe will work in a gas/electric oven as well. Just make sure to use a pizza stone. Note: I used a bit more flour than the recipe states. 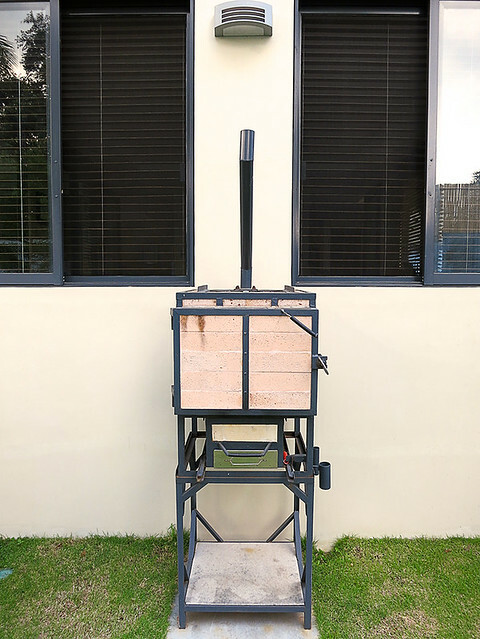 Given the humidity in the Philippines, the dough will be extra sticky so you’ll need that extra flour to firm up your dough. 1. Dissolve the yeast completely in a large bowl by stirring it into 1/4 cup lukewarm water. When dissolved, in 10 mins or less, add 1 cup flour and mix thoroughly with a wooden spoon. Then, as you continue to stir, gradually add 1 tablespoon olive oil, 1/2 T salt, 1/4 cup lukewarm water and 1 cup more flour. When putting in flour and water for the last time, hold back some of both and add only as much of either as you need to make the dough manageable, soft, but not too sticky. 2. Take the dough out of the bowl, and slap it down very hard against the work counter several times, until it is stretched out to a length of about 10 inches. Reach for the far end of the dough, fold it a short distance toward you, push it away with the heel of your palm, flexing your wrist, fold it and push it away again, gradually rolling it up and bringing it close to you. Rotate the dough a one-quarter turn, pick it up and slap it down hard, repeating the entire previous operation. Give it another one-quarter turn in the same direction and repeat the procedure for about 10 minutes. 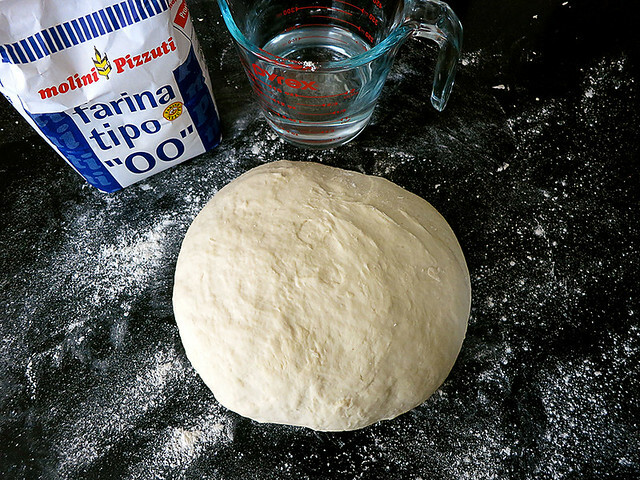 Pat the kneaded dough into a round shape. 3. Film the inside of a clean bowl with 1 tsp olive oil, put in the dough, cover with plastic wrap and put the bowl in a protected, warm corner. Let the dough rise until it has doubled in volume, about 3 hours. It can also sit a while longer. 5. Sprinkle the baker’s peel generously with cornmeal. Take the risen dough out of the bowl and divide it in half. Unless both your peel and your baking stone can accommodate two pizzas at once, put one of the two halves back into the bowl and cover it while you roll out the other half. Put that half on the peel and flatten it as thin as you can, opening it out into a circular shape, using a rolling pin, but finishing the job with your fingers. Leave the rim somewhat higher than the rest. An alternate method—and the best way to thin the dough, if you can emulate it, is the pizza maker’s technique. First roll out the dough into a thick disk. Then stretch the dough by twirling it on both your upraised fists, bouncing it from time to time into the air to turn it. When it is the desire shape, put the circle of dough on the cornmeal covered peel. 6. Put the topping of your choice on the dough, and slide it, jerking the peel sharply away, onto the preheated baking stone. Bake for 20 minutes or slightly more, until the dough becomes colored a light golden brown. As soon as it is done, drizzle lightly with olive oil. Previous Previous post: The Favoritest: 12 Awesome Things That I Put in My Mouth in 2014. Next Next post: The Favoritest: 12 Awesome Things That I Put in My Mouth in 2015.